Kubeflow project aims to make it easy for everyone to develop, deploy, and manage composable, portable, and scalable machine learning on Kubernetes. Machine learning has completely transformed the computing landscape, giving technology entirely new scenarios to address and making existing scenarios far more efficient. However, in order to have a highly efficient machine learning solution, an enterprise must ensure it embraces the following three concepts: composability, portability, and scalability. When most people hear of machine learning, they often jump first to building models. There are a number of very popular frameworks that make this process much easier, such as TensorFlow, PyTorch, Scikit Learn, XGBoost, and Caffe. 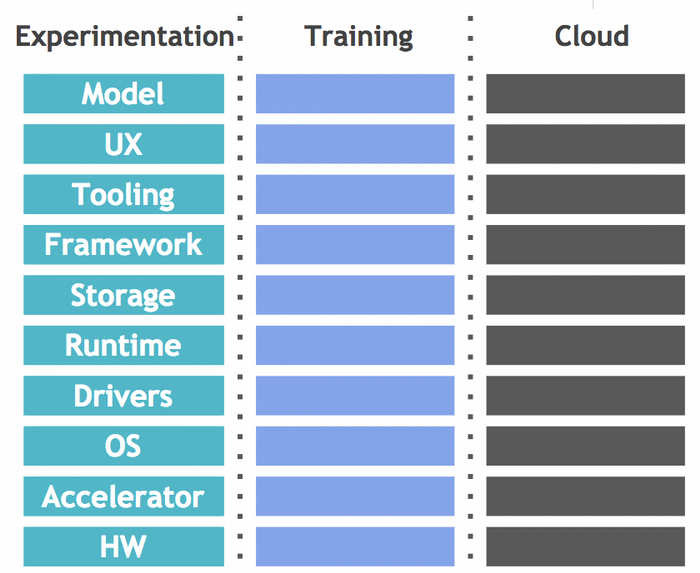 Each of these platforms is designed to make data scientists' jobs easier as they explore their problem space. However, in the reality of building an actual production-grade solution, there are many more complex steps. These include importing, transforming, and visualizing the data; building and validating the model; training the model at scale; and deploying the model to production. Focusing only on model training misses the majority of the day-to-day job of a data scientist. To quote Joe Beda, "Every difference between dev/staging/prod will eventually result in an outage." The different steps of machine learning often belong to entirely different systems. To make things even more complicated, lower-level components, such as hardware, accelerators, and operating systems, are also a consideration, which adds to the variation. Without automated systems and tooling, these changes can quickly become overwhelming and challenging to manage. These changes also make it very difficult to get consistent results from repeated experiments. One of the biggest recent breakthroughs in machine learning (deep learning) is a result of the larger scale and capacity available in the cloud. This includes a variety of machine types and hardware-specific accelerators (e.g., graphics processing units/Tensor processing units), as well as data locality for improved performance. Furthermore, scalability is not just about your hardware and software; it is also important to be able to scale teams through collaboration and simplify the running of a large number of experiments. Kubernetes has quickly become the solution for deploying complicated workloads anywhere. While it started with simple stateless services, customers have begun to move complex workloads to the platform, taking advantage of the rich APIs, reliability, and performance provided by Kubernetes. The machine learning community is starting to utilize these core benefits; unfortunately, creating these deployments is still complicated and requires the mixing of vendors' and hand-rolled solutions. Connecting and managing these services for even moderately sophisticated setups introduces huge barriers of complexity for data scientists who are just looking to explore a model. To address these challenges, the Kubeflow project was created at the end of 2017. Kubeflow's mission is to make it easy for everyone to develop, deploy, and manage composable, portable, and scalable machine learning on Kubernetes everywhere. Because this solution relies on Kubernetes, it runs wherever Kubernetes runs. Just spin up a cluster and go! To connect to JupyterHub locally, simply forward to a local port and connect to http://127.0.0.1:8000. "The Kubeflow project was a needed advancement to make it significantly easier to set up and productionize machine learning workloads on Kubernetes, and we anticipate that it will greatly expand the opportunity for even more enterprises to embrace the platform. We look forward to working with the project members." If you would like to try out Kubeflow right now in your browser, we've partnered with Katacoda to make it super easy. You can also learn more about Kubeflow from this video. And we're just getting started! We would love for you to help. Fei Xue - Fei Xue is a member of the Kubeflow team at Google, an open source effort to help developers and enterprise develop and deploy cloud-native machine learning everywhere. Fei comes from a distributed system development background and did neural network research at Microsoft Research.